The battery supplies electricity to the ecm even when the ignition switch is in the off position. This power allows the ecm to store data such as dtc history, freeze frame data and fuel trim values. If the battery voltage falls below a minimum level, the memory is cleared and the ecm determines that there is a malfunction in the power supply circuit. When the engine is next started, the ecm illuminates the mil and sets the dtc. If dtc p0560 is set, the ecm does not store other dtcs or the data stored in the ecm are partly erased. 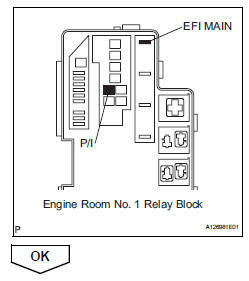 Remove the efi main fuse and p/i fuse from the engine room no. 1 Relay block. 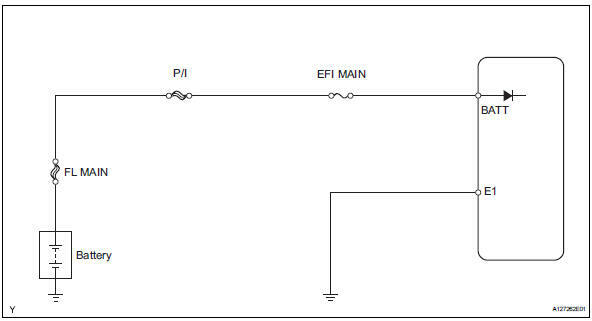 Measure the resistance of the efi main fuse and p/i fuse. Reinstall the efi main fuse and p/i fuse. 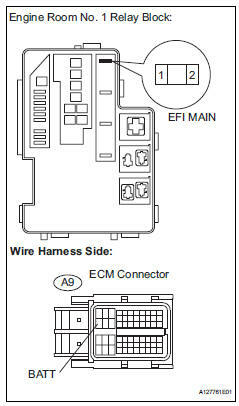 Check the harness and the connector between the efi main fuse and ecm. Remove the efi main fuse from the engine no. 1 Room relay block. Reinstall the efi main fuse. Check the harness and the connector between the efi main fuse and battery. Remove the efi main fuse from the engine room no. 1 Relay block. Reconnect the positive battery terminal. Check that the battery is not depleted. turn the ignition switch off and turn the tester off.